So pretty in pink! 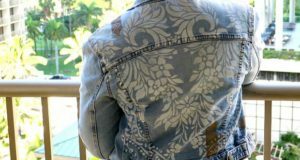 This floral lace stencil project by Danielle is fit for a princess. Actually….it was inspired by a princess. 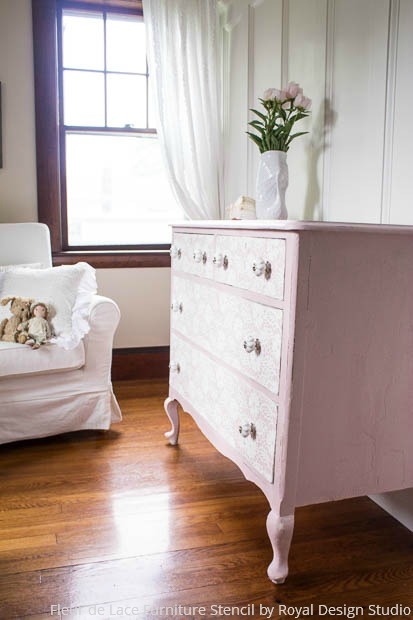 Read on to find out how she achieved this royally feminine stenciled look on an upcycled dresser. I’m a girlie girl. I love pink, peonies and lace. The more the better, really! When I was a young girl my whole bedroom was done in Laura Ashley. Yes, you would have loved it. I loved being cuddled up in there with all my treasures. So, I think this proves my love for all things frilly, lacy, and girlie. 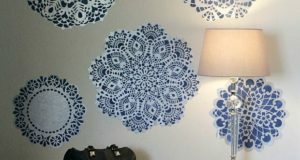 I actuallyhave stenciled my guest room wall with the Parlor Lace stencil from Royal Design Studio. The problem is….I have a house full of boys so there is no proper girlie room for me. BUT, I can always get as girly as I want with the painted furniture I create to sell! I was quite excited about the Royal Birth recently, so here is a painted and stenciled lace dresser in the new princess’s honor. I’m calling this one “Charlotte”. My husband found this great dresser for me. Great bones, great shape. It might look really nice and white, but actually it had layers and layers and layers of paint. These layers of paint were beginning to flake off too. No big deal I thought but I counted white, beige, yellow, blue, pink, gray and primer. I pulled out the stripper before I could even start with my stencil plan. This stage took a LONG time. I fought and fought with the paint, scraping, scraping, scraping, sanding, sanding, sanding, sanding. This went on for DAYS!!!! Step 1: Prep your furniture for painting. I stripped the dresser and sanded as much paint off as I could. Then I washed with mineral spirits and warm water. Once dry, wipe on clear shellac. (I brushed it on so it would seal any flakey bits in of the original paint). 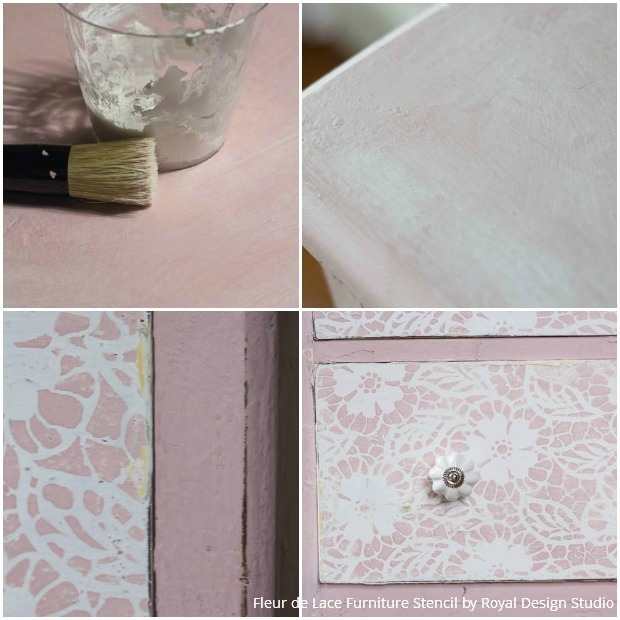 Step 2: Paint body of the dresser in using Antoinette Chalk Paint®, a pale pink with a hint of brown. Annie Sloan says it is the color of plaster. It’s really a lovely color! Paint the drawers with Pure White Chalk Paint® For a professional finished look I always paint the sides of the drawers as well. 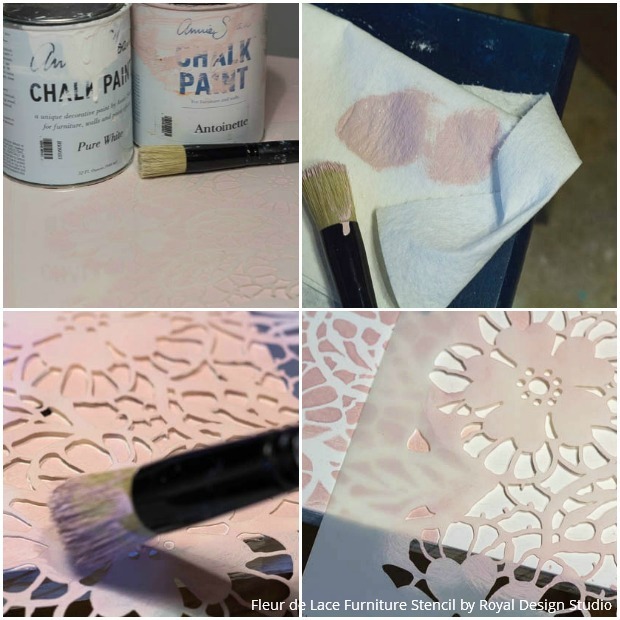 Step 3: Use Antoinette for the stenciling the Fleur de Lace Furniture Stencil on the drawers. First line up the stencil on drawer, then secure with delicate surface tape. Dip just the tips of the stencil brush into the paint and remove the excess paint off the brush by swirling it with a hard pressure on paper towels. Then, softly swirl the brush around the stencil in a circular motion so that you are dry brushing the pattern on. Dry brushing is when you don’t have lots of paint on your brush so the brush is essential dry. This prevents paint from bleeding under the stencil, and gives you a nice crisp finish. Once an area is done, reposition stencil by lining it up with the registration marks built into the stencil. Step 4: Distress the dresser all over for a shabby chic effect. Once distressed you could see the bits of old paint and colors shining through. Step 5: Remove sanding dust with a vacuum and apply clear wax with a brush, make sure to wipe of excess with cheese cloth. (I usually do one coat of wax and wait to apply the second coat the next day). Step 6: Apply tinted wax. 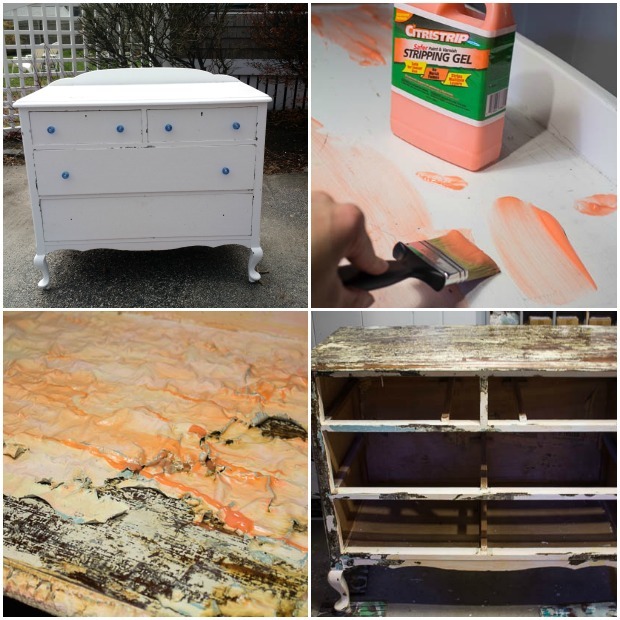 The shellac created a crackle on the top of the dresser so I created a tinted wax by mixing some leftover Pure White with Clear Wax. Lightly brush on with stencil brush, wait a few minutes and wipe off. This allowed for a lovely effect on the top. Step 7: Attach fun hardware. 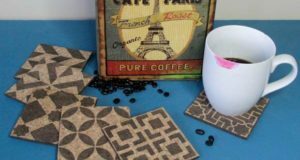 These came from Decor Steals and highlight the white lace! Ta da. 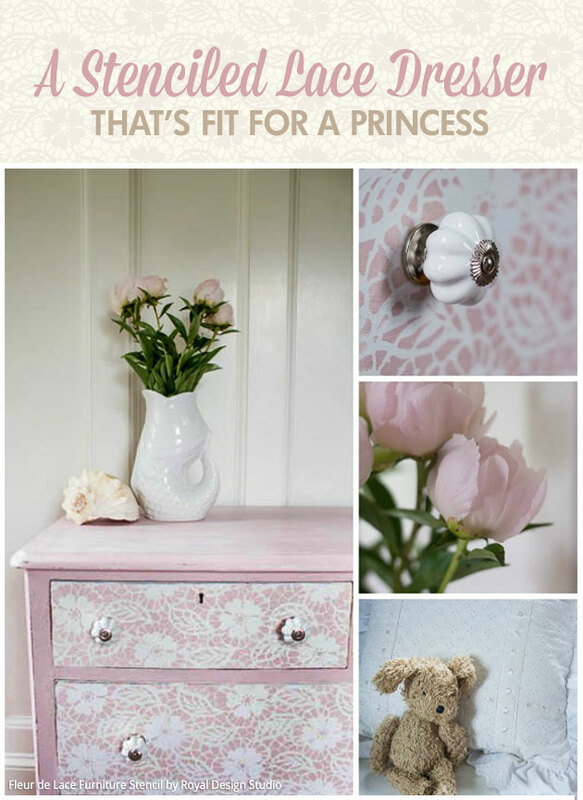 The dresser is ready to be enjoyed by a baby, a little girl or maybe even a princess! What do you think? Will you try and recreate this look in your home? 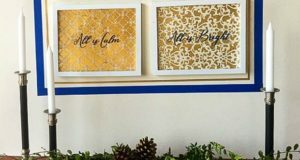 Royal Design Studio has a lovely Lace Stencils Collection featuring allover lace patterns and even some beautifully detailed lace doily stencils. If you want to “get girly”, this is the place to go! 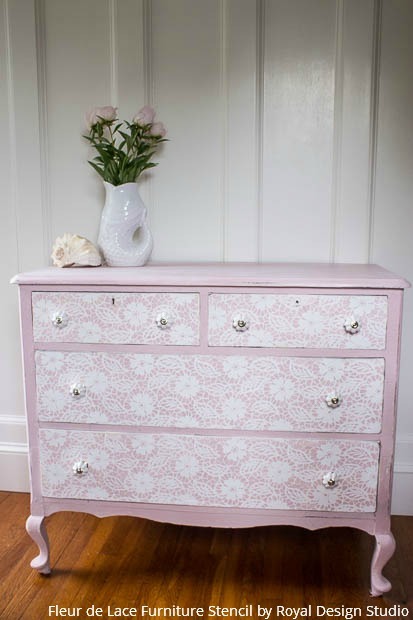 Wow, I love this stenciled dresser – it’s so charming and sweet!